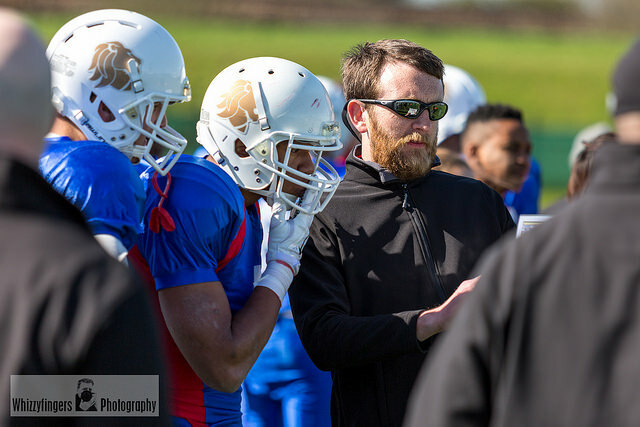 Since I last blogged from the London Blitz camp, I’ve started coaching with the GB Under 19’s programme. This came about from a conversation I had with Coach Anderson who is the Blitz defensive coordinator and the Great Britain Under 19’s HC. My initial role was literally just to help were needed at the trials. It has been a long time since I first coached at the GB youth level and I was surprised by the level of skill on show. There were some players who needed a little more technique work or needed to grow stronger but everyone had the core skills. Once the core of 75 players had been selected we started to prepare for our first qualifying game against Russia. At the first trial Special Teams Coordinator (and all round nice guy) Coach Kenny McPhail was unable to make a training session and I ran the special teams at that training. Coach McPhail installed the rest of the ST playbook and when the game against Russia arrived Coach McPhail scouted and I arranged the ST units on the sideline. The young men did brilliantly and GB U19’s came away winning 21-0. After that game, Coach McPhail informed Coach Anderson that due to work commitments he would be unable to make the trip to Denmark and I was asked to be the interim ST coordinator and I ran the ST units at our last practice. All the hard work is don’t now and I’m looking forward to help coach this team in tournament in Denmark.